Turning the Relay On? Want to know how to turn it off? Do you need help performing a restart or reboot? Find out how in this article! 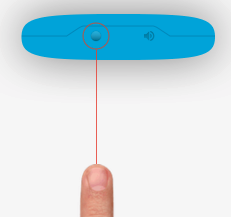 Press and hold the Power AND Push & Talk buttons together simultaneously for 5 seconds. As the Relay device turns on, the Relay will vibrate. After about 12 seconds, the LED ring will spin a white light going clockwise for around a minute. As the Relay device turns off, the Relay will announce it is powering down and will vibrate. The same LED ring will spin a white light going clockwise for around a minute. As the battery depletes, a red LED ring will appear around the center Push & Talk button on the Relay. Relay App will also send notifications of the battery life. If the battery gets critically low, Relay will automatically turn off. Rebooting/Restarting may be also be referred by a Support Agent as "Power-cycling the device"